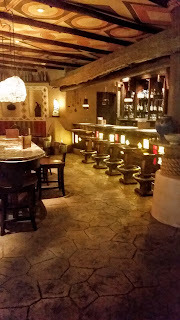 Kingdom Konsultant Travel Blog: Review: Lunch at Sanaa! Hey there Disney Pals and Gals! 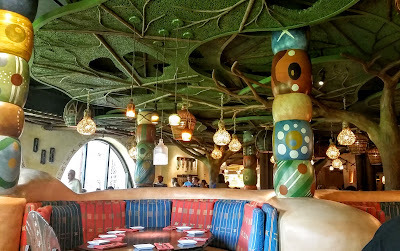 Anyway, today I wanted to share with you a restaurant review of one of my favs, Sanaa, at Disney's Animal Kingdom Lodge's Kidani Village. It may be a little off the beaten path, but this is one place totally worth taking the time to check out, especially if you're a more adventurous eater, or you enjoy some serious flavor. 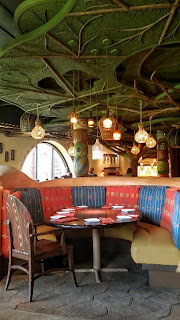 The Hubs, myself, our 8 year old daughter, D, and our 4 year old son, K, along with our friend and very own Divine Ms. M, got to enjoy lunch at Sanaa this past Saturday. It was the day the Disney's Half Marathon was supposed to take place, but it had to be cancelled due to cold, stormy weather, so a place which is normally not too hard to get into, was packed with Guests who were looking for something fun to do indoors. Here's how our visit went. Enjoy! Guests Who Would Enjoy This The Most: Those that like unique dishes and flavors, as well as animal lovers. Fun Stuff for Kids: Talk about a meal with a view! 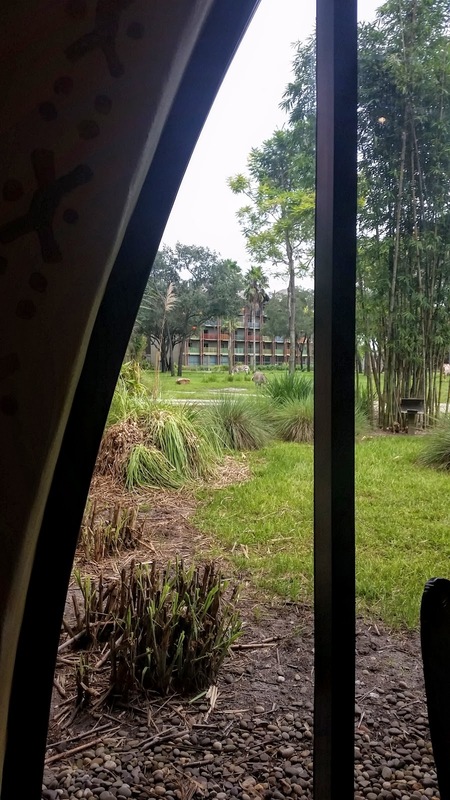 The huge, floor to ceiling windows look out upon the resort's savanna, where you can watch giraffes, zebras, ankole cattle, wildebeests, cranes and more, grazing on grasses and trees. 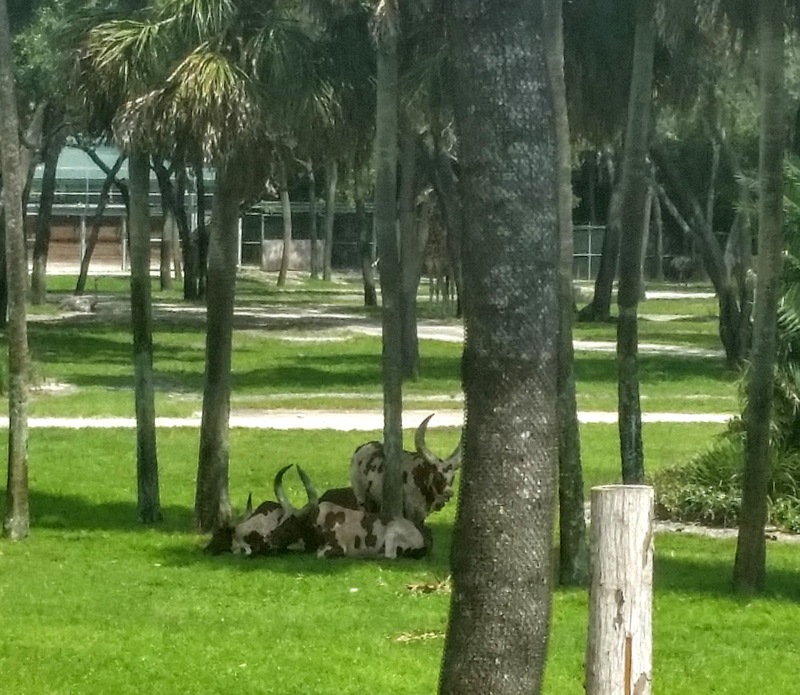 Most kids are enthralled with watching the incredible animals, but be aware that not all tables will have a view. If the view is high on your priority list, check in early, and tell the seater that you are willing to wait for a window-side table. That's no guarantee that you'll get one, but it's your best shot. Rating of Appeal to Kid-Diners: This is cool!!! 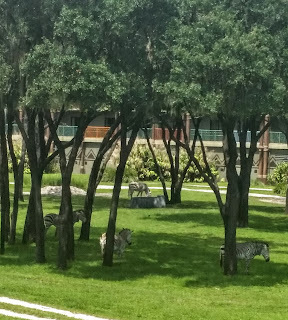 Sanaa is in the newer side of the Animal Kingdom Lodge, Kidani Village. This is also known as the DVC side or the Disney Vacation Club side. 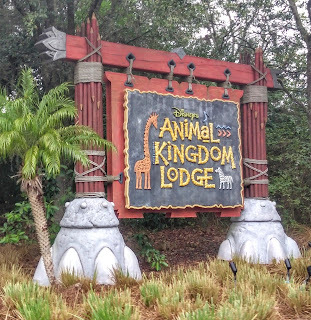 One of the nice things about Kidani is that they have garage parking right underneath the rooms and the lobby, so you don't have to walk outside much at all. 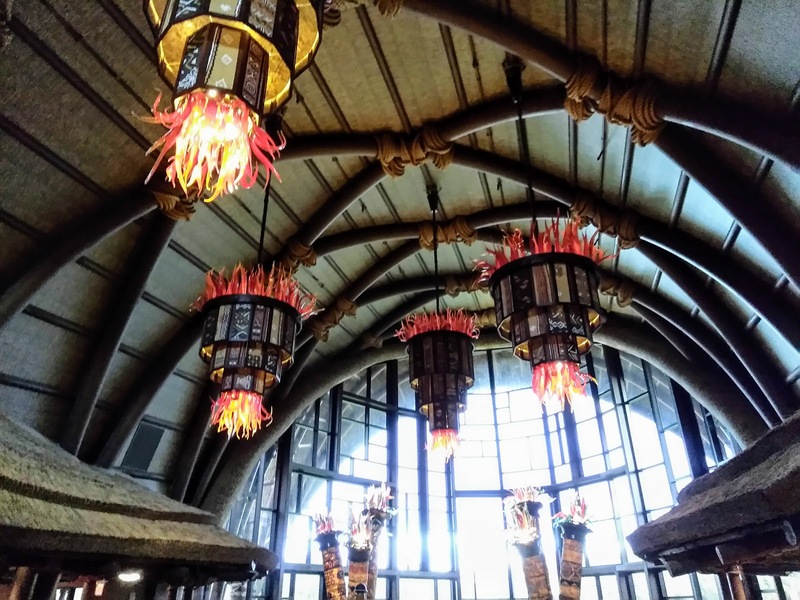 Their main lobby is not as vast and impressive as the one at Jambo House, but it is still authentic to the regions of Africa that it is designed to represent, and it is gorgeous. 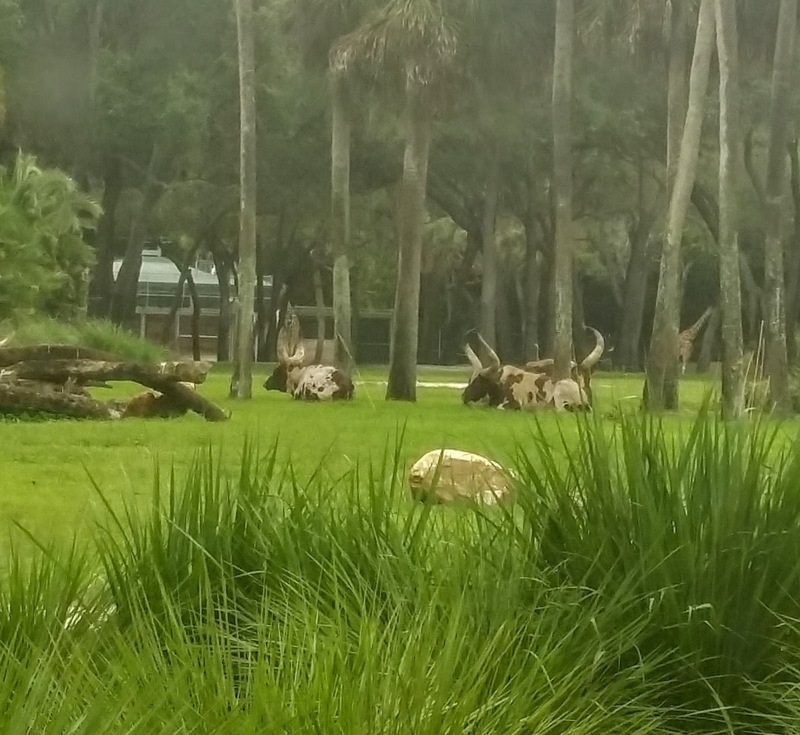 I do feel that Kidani has the better animal viewing savanna. 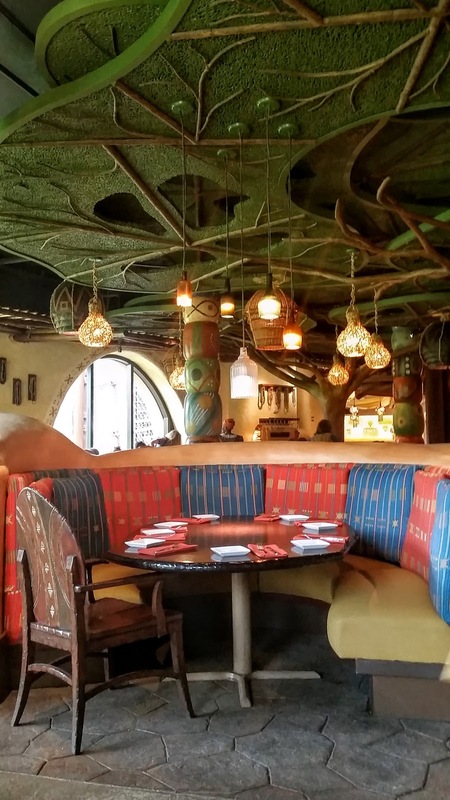 Every time we go there, we see more animals and they tend to be closer to the windows and balconies, which is perfect, since a huge plus to dining at Sanaa is the breathtaking view of the animals on the savanna outside of the large windows. 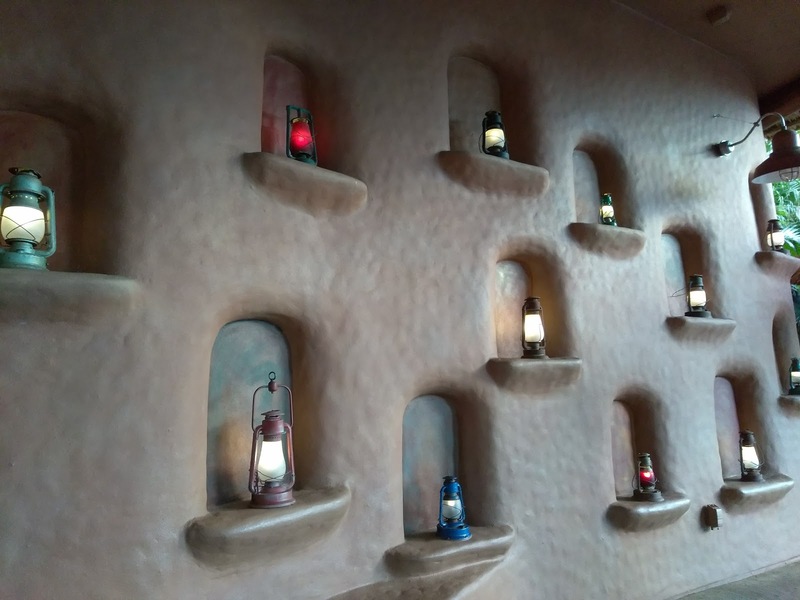 We checked into Sanaa about ten minutes before our scheduled reservation time and noticed there were lots of folks waiting, which I usually don't see happen at this location. They were super busy! In fact, we weren't sat until about a half hour after our reservation time. This was unusual, but also understandable, given the extra Guests that were looking for someplace to go without a marathon to run, (or in my case, watch). 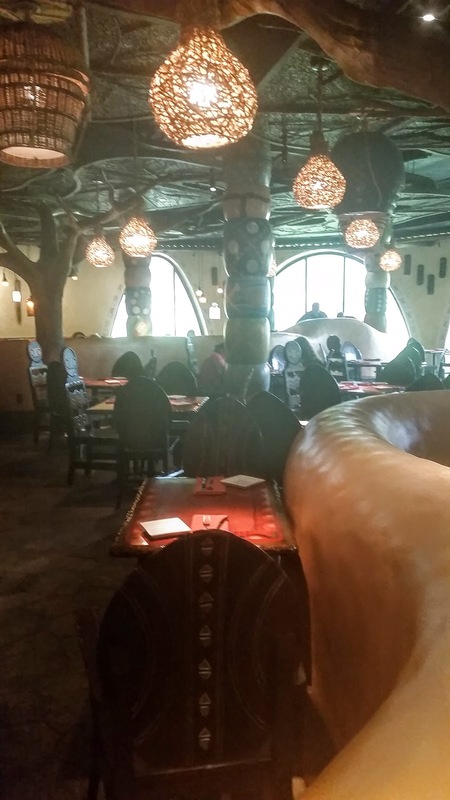 The restaurant is gorgeous, with many African and Indian touches throughout. I love the ceiling, which looks like the canopy of a big tree, with the trunk growing down into the middle of the dining room. There are lots of warm, earthy touches, and even the floor is designed to look like caked and cracked clay. Outside of the windows, we could see Ankole Cattle laying on the ground, (they are the ones with the impossibly large horns), and zebras munching on grass in the distance. Our server came over to welcome us and get our drink order. We let her know about K's egg allergy and she gave me an allergy menu to look at. The Tiny Dictator, (aka K), declared that he wanted pizza, so we were good there. The Hubs looooves the Bread Service at Sanaa, so he immediately placed that order. The naan is amazing! Naan is a flat, doughy bread, sort of like a pizza crust, which is baked carefully in a clay oven. 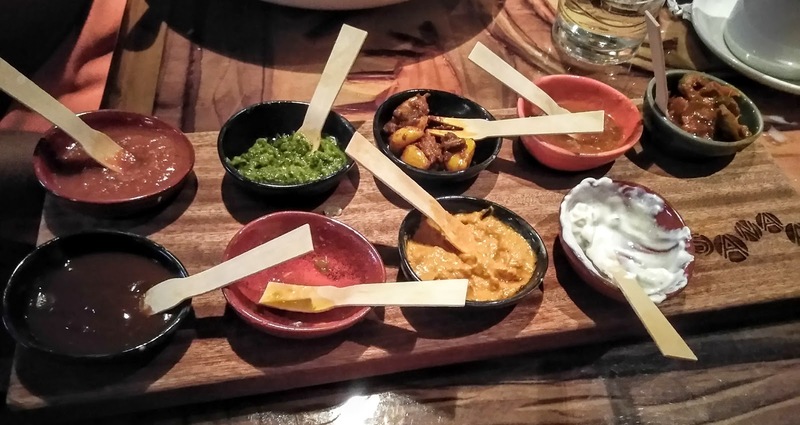 It comes in various flavors and styles, and with the bread service, you can pick three types of breads and three accompaniments, or all five flavors of the bread and all nine sauces. We went with the whole shabang. When the drinks came, The Hubs remembered that for animal safety, Animal Kingdom Lodge, (as well as Animal Kingdom Park), uses paper straws, which he hates. I don't LOVE them, since it's sort of like drinking out of an empty toilet paper roll, but I can tolerate them. 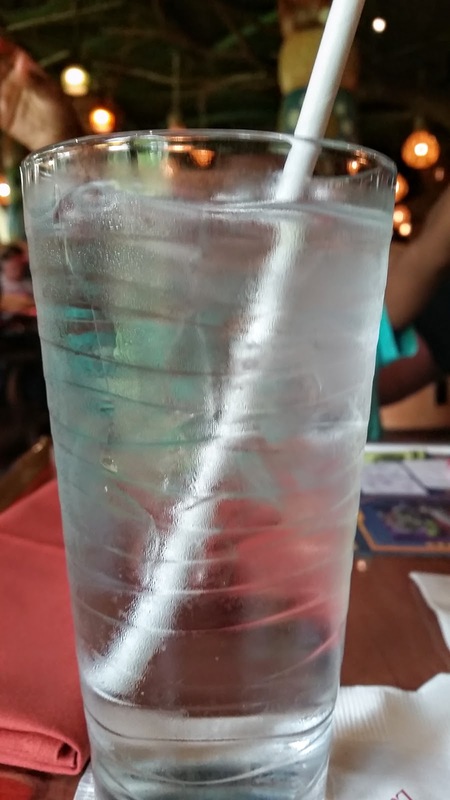 Lucky for The Hubs, I keep an extra Mickey silly straw in K's backpack, just in case we need one, so yes, my husband, as a grown man, sat in a restaurant, drinking from a kid's silly straw. I also ordered a press pot of Kenyan coffee, which was delicious! The Bread Service came out shortly after and looked and smelled fantastic. 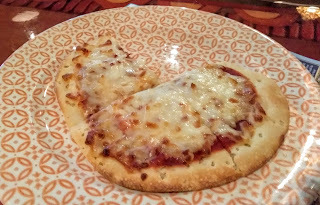 I'm not a condiment person, so I took a plain, Traditional Naan and dug in. 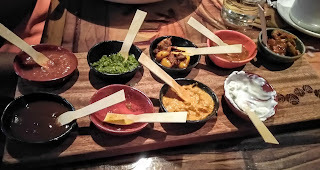 Ms. M and The Hubs really enjoyed the various sauces, with the Coriander Chutney being the clear favorite. The kids each had some naan, too. D loved it and kept asking for more. K, not so much, but in that moment, he wasn't loving much of anything. I think waiting for 45 minutes in the lobby had done him in. We placed our orders right after receiving the drinks and the entrees came out within 10 minutes of ordering them. 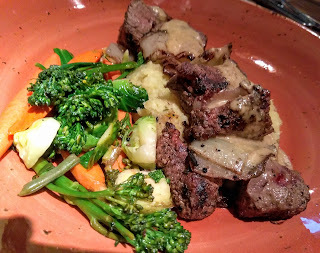 Ms. M and I both go the beef tenderloin, MishKaki. It's basically tips, in a tangy ginger marinade, with mashed potatoes and roasted veggies. Now, beef tips are always tricky with a temperature, since they vary in size, but Ms. M's "medium" tips were more like medium-well. I had ordered "medium-rare" and most of mine were closer to rare, but again, this is pretty reasonable for tips. Had it been a whole tenderloin, we may have had to have one or both of ours redone, but we were both good with what we had. We both commented on the delicious flavors, particularlly on the veggies. The carrots, broccolini, onions and brussels sprouts were tender, but crisp and fresh, with just a light seasoning. The smashed potatoes were also delicious, but the star was, as it should be, the meat. Really fantastic tenderloin tips and the ginger marinade was the perfect complement, though I could have done with less tanginess. K's pizza looked ok, but not really like anything special. It did not come with any sides at all, and when K declared that he "didn't like it", he ended up stealing some of my side veggies. In all fairness, he was pretending to be Judy Hopps and needed some carrots, so I totally got why he needed them. Plus, he was stealing my vegetables. What kid does that? I was very proud of D because rather than ordering one of the safer kids meals, like a burger or chicken, D chose the African Buttered Chicken. 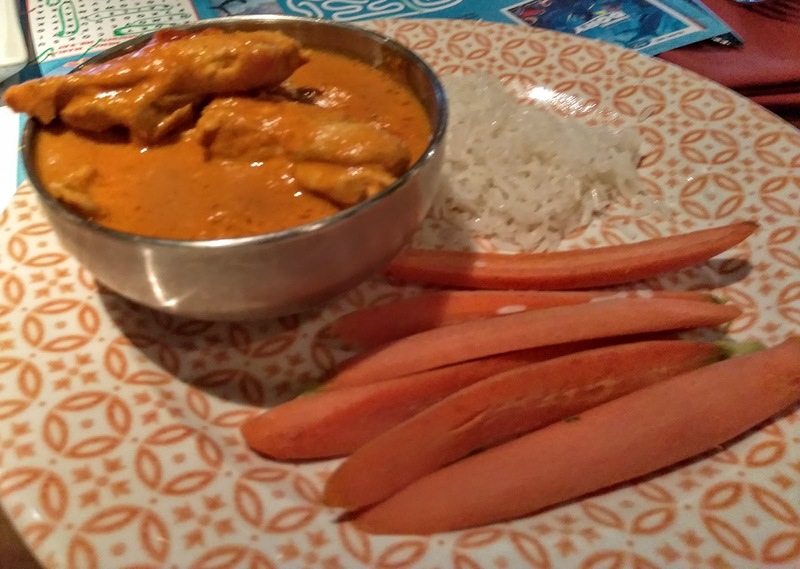 It came with basmati rice and carrots. She liked the whole meal quite a bit and happily gobbled it up. 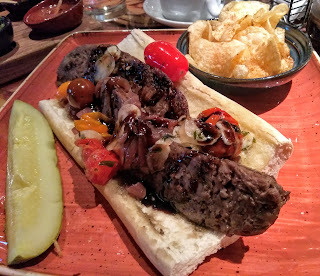 On the server's recommendation, The Hubs ordered the Boerewores Sausage Sandwich. He was immediately disappointed. He found the whole sandwich to be very bland and almost flavorless, especially when compared to the delicious bread service. The server noticed his dismay and right away asked if he'd rather switch out for his second choice, which had been the Kenyan Coffee Barbecue Sandwich. That was so nice of her to do! 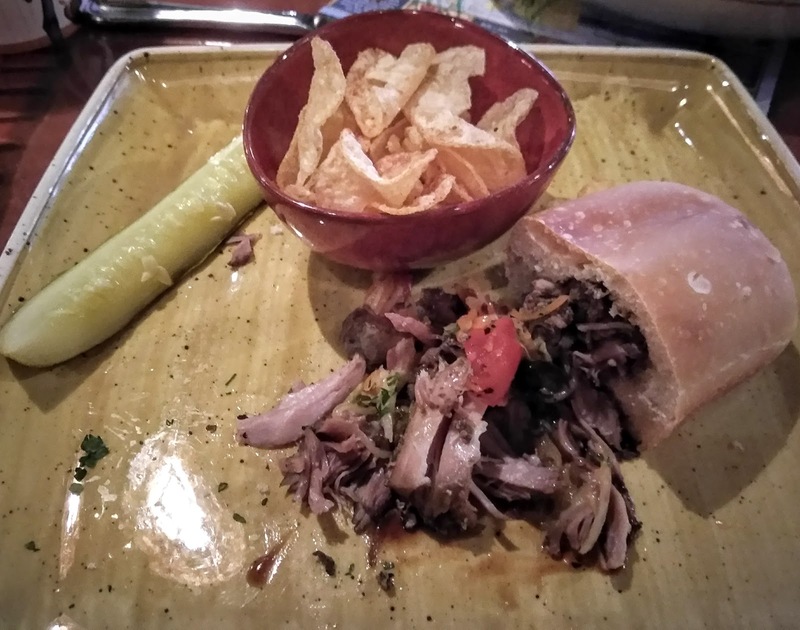 The Hubs was very pleased with the second entree, which was basically an African-inspired pulled pork sandwich. It had a warm root veggie slaw on it, and was served on a naan bread bun. The Hubs was in heaven! So was K, since he had stolen the side of chips that came with the pulled pork. I swear, we could eliminate all entrees and feed this kid just side items for the rest of his like, and he'd be thrilled! The barbecue sandwich...well, half of it. 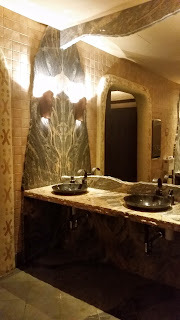 Before dessert, we had to make a potty run.... Can we just look at this potty.. I mean, bathroom? K got a bowl of vanilla ice cream, with Mickey sprinkles. D chose raspberry sorbet with berries on top. (I didn't manage to grab a picture of either of those, since my kids devoured them.) Everyone else passed, but I decided on the African Povu, a Tanzanian Chocolate Mousse, which is flavored with Kenyan coffee and topped with vanilla rum caramel and sea salt. I mean, what about THAT doesn't sound awesome? 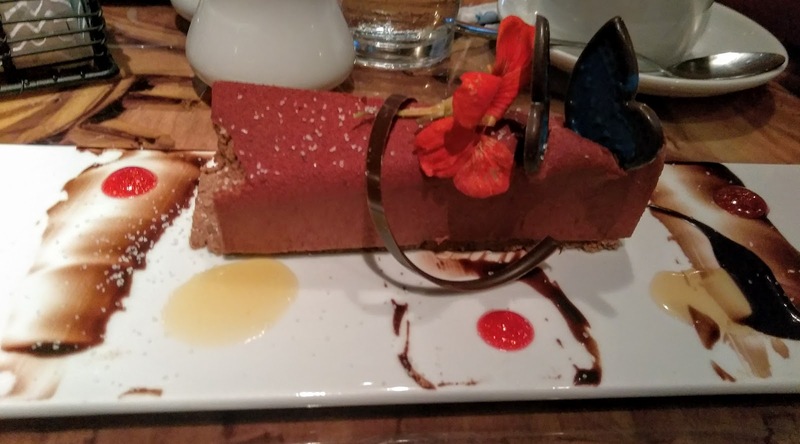 And it was impressive, in that the mousse was smooth and rich, and the salt was a nice touch, but unfortunately for me, the one very clear flavor that I got in the dessert was orange. There's only one flavor I can't STAND in my chocolate. You guessed it... orange. I ate it, of course, (tee-hee), but all the while muttering about how I hate chocolate and orange together. I'll skip this dessert next time. As we wrapped up, the restaurant had emptied out, and the kids went over and took a look out some of the windows, at the animals that were grazing about. They saw zebras, wildebeest, cranes and more. 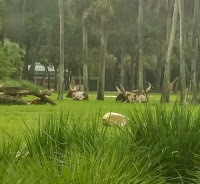 All of the animals were close to the windows and just going about their business, totally unfazed by us tourists, staring at their every move. 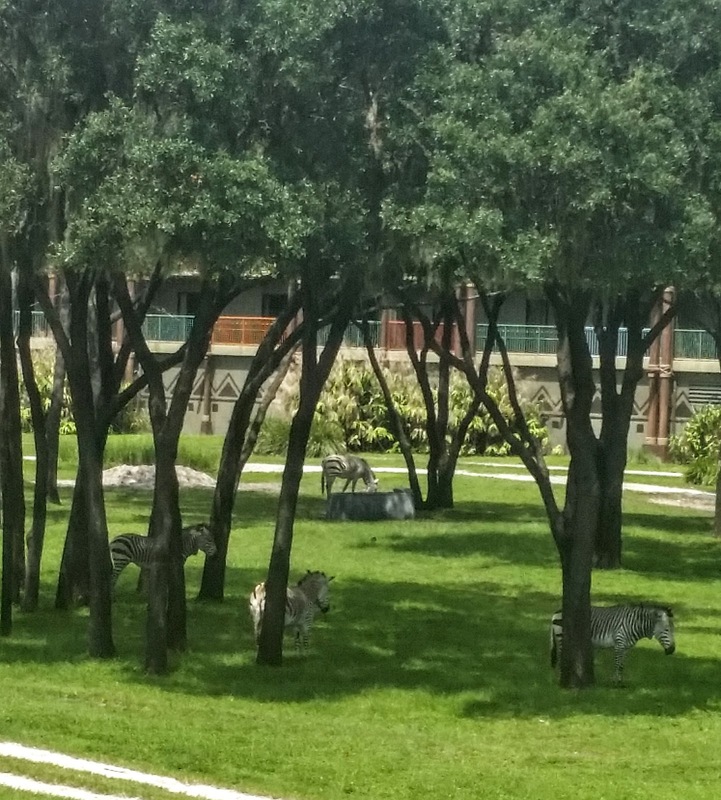 Although, is it just me, or does this zebra on the right seem pretty convinced that he is hiding behind that tree? According to D (8 yo girl) D, what did you like about Sanaa? "I like the, um, I liked that I got to see the animals when I was still eating and, um, I liked the food that I had, the buttered chicken stuff....and they were, they, so I liked that there was good food and I got to see the animals and um, we, um, um... yeah, I liked that I saw the animals and I liked the food and yeah, it was good. Yeah." My, that was concise. Will we be back? : We will be back again, I am sure. Sanaa is definitely unique and when you combine the food with the view and the atmosphere, it's irresistible.